An underwater camera isn't unique...unless it's this one. 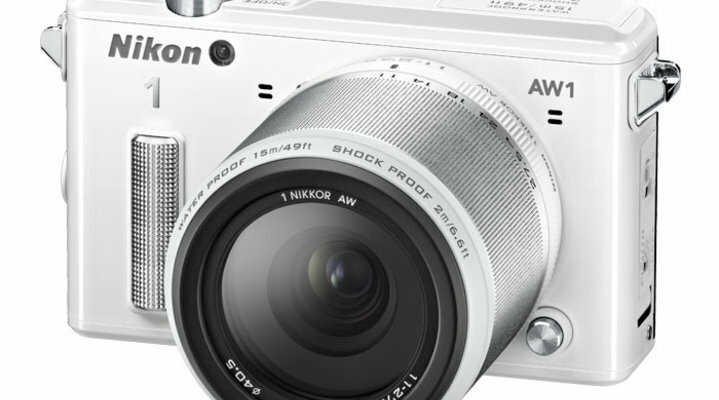 The Nikon 1 AW1 is the only one of its kind: a self-contained, waterproof and shockproof interchangeable lens camera. Simply, no housing required. Take this 14.2-megapixel compact system camera into the pool or the ocean; carry it fearlessly to the beach, the dirt track or out into the rain, wind and snow. All the camera's connection points—lens mount, USB slot and battery compartment—are sealed and locked. The AW1 will be available in three colors, black, silver and white, and you can further personalize yours with optional accessory silicone skins that cover the camera and its underwater lenses. The skins will be offered in three colors: black, khaki green and orange. The AW1 offers a built-in flash for underwater as well as land-based illumination and a built-in grip. A special underwater white balance setting will automatically provide richer colors in the underwater environment, and an underwater creative mode offers three selections from which to choose the color balance of blue and green: standard balance is best suited for shallow water; scuba for greater depths; and close-up for images of people, fish, coral and plants underwater. The AW1 also offers automatic pincushion distortion control to negate the optical effect that often occurs when light rays pass through both water and the glass of a lens. The AW1 is a family-friendly, go-anywhere camera that will deliver the quality images and the advanced features and capabilities the Nikon 1 system is known for. Whether it's for the beach, the pool, water pistols at 20 paces or taking advantage of the "bad weather is good weather for photography" adage, the Nikon 1 AW1 is the ideal image-maker for a range of shooting situations. Waterproof down to 49 feet. 15 frames per second top continuous shooting speed at full resolution; 30 to 60 fps with focus locked on first frame. Maximum shutter speed 1/16,000 of a second. Scene modes include night landscape, underwater and night portrait. Creative modes include backlighting, soft, easy panorama, miniature effect, selective color and underwater. Exposure Compensation in +/- 3 EV in increments of 1/3 EV. Full 1080p, 60i, 30p video; slow-motion video at 400 and 1200 fps; motion snapshot at 1080p and 60p (plays at 24p). Auto area AF; face-priority AF; subject tracking; single-point AF. White balance settings of auto, incandescent, fluorescent, direct sunlight, flash, cloudy, shade, underwater and preset manual. Wi-Fi capability with the optional WU-1b Wireless Mobile Adapter, built-in GPS.